Stellar Lumens [XLM] jumped over EOS to become the 5th biggest cryptocurrency by market cap. Although the difference is only a $100 million, the past 24-hour pump of 26% has given the XLM investors something to brag about. 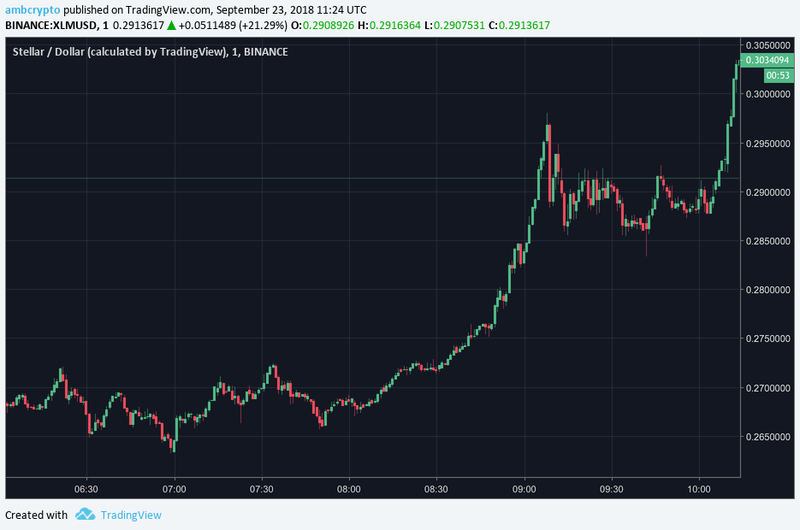 EOS, at press time, was trading at $6.08 to a token with a market cap of $5.5 billion, Lumens [XLM] on the other hand was trading at 29 cents with a $5.6 billion market cap. The entire market has seen a positive green week with some big jumps in XRP, Cardano [ADA] and Tron [TRX]. Many have speculated that the XRP pump was in the anticipation and expectation of xRapid’s performance. Cardano and Tron have been buzzing and active with weekly updates from their core teams. Despite the bearish market, as many from the community say, there have been huge developments in the cryptocurrency space, much bigger and meaningful than last year. EOS after hitting its peak at the end of April at above $20 because of the Mainnet hype, succumbed to the market pressure and dropped by almost 4x its peak value to currently trade at $6. Stellar Lumens, on the other hand, like many other coins hit its peak at $1 in early January this year during the bull run. Just 4 weeks ago, Stellar hit a new milestone after registering 1 million accounts on their ledger. Over the past two months, there have been major partnerships and announcements that according to many has set the mood for the current pump. From ‘Tempo‘ the largest payment network for crypto-fiat trading announcement to Sharia certification to partnerships with SharesPost, Lightyear.io, TransferTo and Shift Markets. 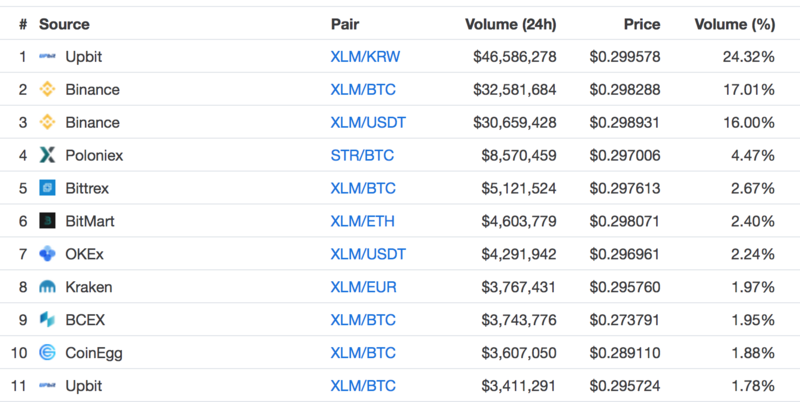 24% of the recent volume of Stellar Lumens has come from Korean exchange Upbit with the XLM/KRW trading pair. The change in trend and the toppling of EOS has ignited the Stellar reddit and other social media channels abuzz.